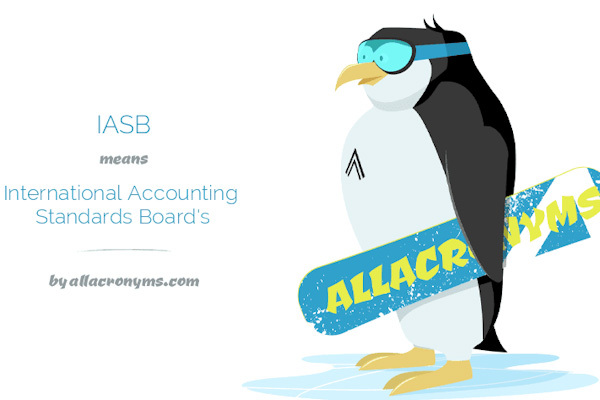 International Accounting Standard Board (IASB) was established in 2001 replacing its predecessor International Accounting Standards Committee (IASC). Monitored by IFRS Foundation, main purpose of IASB is to issue International Financial Reporting Standards (IFRS) which will help in generating simple, yet detailed and uniform accounting reports globally. In order to issue an amendment or a new accounting standard IASB has to follow a due process based on transparency, full and fair consultation and accountability. Due process includes various stakeholder involvements at different steps. The process can be categorized as technical programme, standard setting and implementation and maintenance. The due process can be further improved with encouraging end users of IFRS further in developing or amending IFRS. Accounting experts view IFRS in two different perspectives. One school of thinking is IFRS improves reporting quality by bringing in order and uniformity whilst other school of thought is IFRS demolishes opportunity to include unique details of each business entity in to reports thus leading to reduction of details. Apart from impact of these perspectives politics has a role which affects duties of IASB the foremost powers being US and European Union. Generally Accepted Accounting Principles in US (US GAAP) is often compared with IFRS. Therefore, IASB has to compare and consider weak positions in IFRS with US GAAP. IASB successfully launched IFRS 2 providing guidelines on reporting share based payments and IFRS 8 on operating segments. Developing economies that adopted IFRS has received more international recognition in terms of financial reporting. Thus, IASB has played a critical role in setting international accounting standards and they need to move forward in collaboration with other standard setting bodies whilst being vigilant on political influence. Accounting occupies a significant function in modern industrialized society which is globally intertwined. Burchell et al. (1980) states, increasing institutionalization of accounting within organizations and growing objectification and abstraction of accounting knowledge are the reasons behind the gravity accounting holds in modern world. The institutionalization of accounting is associated with formation of specialized accounting departments within organizations, recruitment of specialized staff in accounting and formulation of specific accounting systems. The professional knowledge of accounting formulated with more informative, user friendly and easy approaches which signify the objectification and abstraction. Owing to these improvements accounting flowed slowly in to entities and remained within them permanently. Different entities adopted different accounting standards. The definitions, accounting techniques and reporting standards were unique to each entity. The uniqueness of accounting practices of each entity, presented a problem in comparing two entities on a common platform. With the prospects opened in the era of industrialization and globalization organization were looking for opportunities to interconnect, disconnect and venture in to new dimensions. However, comparing and assessing financial value of entities were difficult as accounting standards were not in a common platform. With the objective of developing a common accounting practice, The International Accounting Standards Committee (IASC) was formed in 1973. Professional accounting bodies of Australia, Canada, France, Germany, Japan, Mexico, the Netherlands, the United Kingdom and Ireland, and the United States of America were part of the initiative. The IASC Board, which is the standard setting arm of IASC, enacted significant amount of standards, a conceptual framework, interpretations and other guidelines which was adopted by many organizations. The standards set by IASC from 1973 to 2000 are known as International Accounting Standards (IAS). In 2000, the standard setting body was restructured as The International Accounting Standard Board (IASB) and a new IASB constitution was in effect. IASB was designed to operate under IFRS Foundation as the overseer. The accounting standards issued by IASB from 2000 onwards are termed as International Financial Reporting Standards (IFRS). I66 Jurisdictions are using IFRS as per 2018 (IFRS 2018). IFRS Foundation is an independent, non-profit organization created under the laws of the state of Delaware, United States of America. Several boards and committees are under IFRS Foundation as supporting arms in fulfilling IFRS operations. These supporting arms can be classified under four categories based on nature of their engagement as governance, technical, advisory and specialized advisory groups (IAS Plus 2018). Duties relevant to governance are a responsibility IFRS Foundation, Due Process Oversight Committee (DPOC) and Monitoring Board. IFRS Foundation has the overall responsibility of overseeing the duties of IASB, structure and strategy whilst raising funds. DPOC is a trustee committee bearing responsibilities of overseeing IASB compliance to due process and approving the due process. Monitoring Board involves in trustee nominations, approving trustee appointments and overseeing the trustees. IASB and IFRS Interpretations Committee perform technical duties. Sole duty of IASB is to establish IFRSs. IFRS Interpretations Committee is responsible to interpret applications of IFRSs and provide guidance on financial issues which are not addressed by IFRSs within the IASB framework. Accounting Standards & Advisory Forum (ASAF) and IFRS Advisory Council provides relevant advice and guidance to IASB and IFRS respectively. Apart from these main advisory bodies there are several specialized advisory groups as well. The due process is based on three principles which are transparency, full and fair consultation and accountability (IFRS Foundation 2016). With the purpose of achieving satisfactory levels of each principle, elements are added in to the due process. Public meetings, balloting and voting mechanisms are included within the due process in order to maintain transparency. Meeting of IASB and interpretation committee is open to public. Meeting schedules and other relevant details are published in IFRS Foundation web site. In order to make informed decisions participants for these meeting receive details on what will be discussed before 10 – 14 days of the meeting. The conclusions reached at meetings are published as IASB updates. Minimum voting requirements have been designed for all relevant decisions within the constitution. To ensure full and fair consultation, there are mandatory consultation requirements and optional requirements. If a decision is made not to undertake optional consultation procedure, IASB should provide a reason to it to DPOC. Apart from this IASB needs to engage investors, national and regional accounting networks and IFRS Advisory Committee in their decision making process. Public responses may be received in the form of comment letters. Almost all the comment letters received are published in the website unless a requirement arises to do otherwise. Field work and public hearing are some other ways to achieve satisfactory level of full and fair consultation. In order to maintain satisfactory level of accountability IASB engages in various activities. Effect analysis includes an assessment and knowledge on cost and benefits of amended or new standards. It is a confirmation to IFRSs users about the benefit of amendment or new standard. IASB set IFRSs based on supermajority votes. In case a member dissent, he/she has to express the dissenting opinions. Theses opinions are published with the basis of conclusion. IFRS Foundation’s constitution provides full discretion of technical programme to IASB. IASB is required to conduct public consultation on their work every five years which is termed as agenda setting. Usually 120 days are allocated to receive public feedback on IASB programmes. In addition to public consultation, Advisory Council also provides consultation to IASB. Once the feedback is received IASB has to inform trustees how they expect to respond to it through DPOC. New reporting standards have to be developed to address issues arising from existing standards. Thus, understanding the issues in current standards is the first step in the process of amending an existing standard or introducing a new standard. Therefore, a comprehensive research programme is conducted to collect evidence on possible issues. However, IASB is not expected to undertake every research programme. Other accounting standard setting bodies, academics or interested parties can participate in the activity whilst IASB provide clear guidance on what issues research is needed. IASB needs to maintain an updated summary on research conducted and areas where research needed to be done in future. IASB has to report these updates to Advisory Council. Research papers and discussion papers are the main output of research programme. Research papers include overview of the issue, comments and opinions of interested parties and possible approaches to address the issue. Research papers can be prepared by either IASB or the party involved in conducting the research. However, the level of IASB involvement on the research needs to be clearly mentioned. Discussion papers are presented by IASB. It reflects different opinions of IASB members on a particular issue. If sufficient evidence is found that the issue is important and warrant and amendment or a new standard, standard setting process is initiated. To add a project to a standard setting level IASB needs to develop a project proposal. Projects are distinguished as major and narrow scope based on set of criterion. All proposed new standards and amendments are open for public discussion. After receiving feedback on project proposal an exposure draft is developed. It includes specific and comprehensive details on the new standard or amendment proposed. If dissenting opinions are expressed by IASB members those are included in the exposure draft as well. Exposure draft is developed in public meetings. The basis of exposure draft development is the research and recommendations of the technical staff, comments received from discussion or research paper and feedback from advisory committee and consultant groups. The responsibility for maintaining IFRSs lies with IASB and interpretation committee. They need to be vigilant on divergent reporting practices, cases of doubt about applying standards to a particular circumstance and concerns about poorly specified disclosure requirements. From this point the due process continues in a cyclic manner starting from research programme again. Sutton (1984) states that probability of making an impact to an outcome of process increases if lobbying is part of the process from early stages. Agenda setting process, discussion papers, research papers and exposure drafts provide the opportunity to users to voice their opinion and lobby IASB. However, Georgiou (2010) has found that substantial number of firms which are using IFRSs chose to lobby through indirect methods such as representative organizations like Institute of Management Accountants (IMA). The users were also discouraged by the cost of lobbying and the belief that other users will voice the same issues they are tackling. Georgiou (2010) further conclude that IFRS user firms do not perceive their comments are particularly influential in IASB due process. Instead they believe that accounting profession and other standard setting bodies have more influence. IASB should consider these perceptions. If not, the standards issued will eventually become biased and will not match the expectations of end users. Financial instruments are assets which can be traded between entities in the form of cash, contractual right to deliver or receive cash or evidence to an ownership of an entity. They can be used in the form of cash, shares or debt. To provide detailed and timely depiction of an entity to financial statement users, financial instruments have to be reported. It is necessary to avoid complexity in reporting yet all relevant details have to be provided to users to make informed decisions. Uniformity of reporting is also important in comparing entities. Since 2005, IASB and Financial Accounting Standard Board (FASB) have been working together to develop reporting guidelines for financial instruments. Their objective is to simplify and improve reporting for financial instruments. FASB has the right to establish and interpret Generally Accepted Accounting Principles (GAAP) in the United States. The United States has not made IFRS compulsory in reporting financial instruments and most USA companies use GAAP to report financial instrument. Thus collaboration of IASB and FASB is required to deliver common reporting practices globally. The IASB’s endeavours on launching IFRS have been considerably effective, but formal acceptance or recognition of IFRS depends on a genuine meeting of minds about the principles that they embody (Whittington 2008). IASB received a remarkable endowment from its predecessor, IASC not only in terms of standard setting but in terms of international support. ICAEW (2007) states that implementation of IFRS has been challenging, but successful. Significant economies as China, India, Brazil, and Canada have adopted IFRS. Accounting experts view IFRS in two different perspectives. Proponents contend that IFRS has reduced allowable accounting alternatives, opportunistic discretion of management and brought in a better reflection of a company’s financial situation. The opponent argument is based on differing economic systems, business cultures and institutional framework. They argue that limiting management discretion on reporting will eliminate more reflective numbers and statements being included in the report. IASB needs to understand the underlying concepts of these two schools of thoughts and satisfy the proponents whilst convincing opponents through delivering timely, relevant and well planned accounting standards. Whittington (2008) states discord over IFRS may arise due to the pains of transition in to a new standard and will to control the standard setting process. He also argues both these factors are reinforced by culture of the individual constituency. Individual constituencies might be defined at country level. However, within countries there are separate constituencies by industry groups, preparer groups or user groups. Based on their regular practices, degree of pain caused in the transition and will to control can vary. IASB needs to understand these different accounting cultures and their preferences. Whittington (2008) suggests IASB to overcome these cross culture differences by signing up these constituents in to the conceptual framework. However, on the other hand he argues that although the conceptual framework is intended as a means of harmonisation, the process of developing it can be a source of discord as different accounting cultures, profession and their requirements have to be taken in to consideration. IASB is responsible towards IASC Foundation, which is not for profit organization. Even with such increased independence, the IASB continues to be under enormous pressure from global politics (Sodderstrom & Sun 2007). After the global financial crisis of 2007 – 2009 repoliticalization of accounting standard setting was obvious (Bengtsson 2011). Before the crisis although there were political interruptions IASB managed to be independent and act according to the organization’s purpose. Exemplary situation for this is IAS 39 (Revised in 2002) or fair value accounting standard and concerns expressed by EU along with the global financial crisis. Under IAS 39 reporting guidelines, banks experienced increased volatility in their balance sheets and earnings, affecting investor and regulator views of the bank’s stability. Thus, although IASB issues accounting standards, adoption of these standards may hold terms and conditions from adapting entities and some entities try to intimidate IASB. G20 leaders were supposed to meet in November 2008. Considering the opposition to IAS 39 from EU, IASC Foundation sent a letter to G20 summit chair President Bush, defending the fair valuation. However, G20 leaders pointed several reforms to be considered by accounting standard setters. European Commission followed G20 steps, and developed another report. EC report requested IASB structure to be more open and sensitive to stakeholders and convert the governance structure of IASB far more responsive. However, accounting profession represented through organizations as Foundation of Economic Education (FEE) defended fair value accounting. But due to political pressure, IASB issued exposure draft for amended IAS 39 which was again subjected to resistance and criticism. The structure of IASB was also reformed. As a result of concerns expressed by EU countries, the European Committee (EC) endorsed IAS 39 with an amendment to allow hedging accounting for banks’ core deposits, which is prohibited by both US GAAP and IAS 39 (Soderstrom & Sun 2007). Even though IASB tried to resist the political influence, eventually politics succeeded. However, IASB launched IFRS 9 in 2014 which becomes effective in 2018, replacing IAS 39. Crawford et al (2013) state that purpose of founding IASC was to facilitate entry of UK in to European Economic Committee (EEC) in a dominant role. US also approved the move as they needed to develop an international accounting standard which can be acceptable and matched with to US accounting practices. A prevailing argument amongst accounting professionals is that accounting standards has been narrowed to Anglo American Capitalism via IASB. A major drawback of IASB is US, who bears significant role in global economy not adopting IFRS. A formal commitment to convergence was ratified between IASB and IFRS in 2002 by signing a memorandum of understanding. Despite the efforts of convergence, FASB holds a considerable power over IASB since FASB represents world’s largest market where investors and international firms are keen to get in (Crawford et al 2013). As a part of the pact to convergence IASB released IFRS 8 which is identical to Statements of Financial Accounting Standards (SFAS) 131. Some accounting professionals view IFRS 8 as unnecessary and purely introduce to the sake of convergence with FASB (Crawford et al 2013). Even though the purpose of IFRS 8 introduction was converging accounting standards of IASB and FASB, IASB seemed to adopt US standards. The intimidation of standard setters by political bodies is termed as political lobbying by Zeff 2006. The standard setters are mostly politically lobbied in situations where they propose a standard on an issue which has not been covered previously. European Union challenged IASB when it was releasing IAS 39 (revised in 2002) and, at the exposure draft level of issuing IFRS 2. However, introducing IFRS 2 applied for share based payment arrangements is a notable and appreciable action by IASB. Before the issuance of IFRS 2, accounting treatments for share based payments varied greatly and comparability was difficult. IASB was able to fill this gap in accounting with IFRS 2. Many accounting professional view US use IASB as a political expedient in a subtle manner. This was brought in to open discussion with releasing IFRS 8 in 2006 which mimicked US GAAP standards and European Union was the one to challenge IASB again. IASB needs to understand that opposition is obvious while issuing a new standard. However, IASB also needs to comprehend that there is an alternative standard setter in the form of US GAAP and those who use IFRS should not be disadvantaged due to this. Investments made by a firm or individual in one country in to business interests located in another country are termed as foreign direct investments (FDI). The search for general determinants of FDI has not being successful. Gordon et al (2012) conclude overall FDI inflows are positively associated with a country’s decision to adopt IFRS. However, the association is statistically significant for those countries classified as developing economies, but not for countries classified as developed economies. Gordon et al (2012) further states that the accounting literature on IFRS has paid little attention to FDI related issues and further research is a must in this arena. Okpala (2012) has studied the effect of IFRS adoption on FDI received by Nigeria. He states that although there are pros and cons in adopting IFRS, the benefits outweigh the negative outcomes. Therefore, the conclusion to derive is that investors trust IFRS over national economic practices of developing countries. This is a scenario where IASB can further gain trust of investors and convince developing economies to adopt IFRS. European Commission (EC), the predecessor of European Union (EU) was aiming to harmonize accounting practices of member states since 1960s. EU parliament implemented regulations requiring all public listed companies in EU to adopt IFRS in preparing consolidated financial statements 2005 onwards. Efficacy of IFRS relies on other institutional factors related to managerial incentives and business environment. Many researches have used EU as a research setting to measure impact of IFRS as other macroeconomic impacts are minimal within EU member states and the common law strongly forces public listed companies in EU to adopt IFRS. Chen et al. (2010) conclude that improved accounting quality in European Union is attributable to IFRS than any changes in general business environment. The term “accounting quality” is elusive and subjective in view of the various usages of financial reports. Chen et al. (2010) has defined accounting quality as the extent to which financial information reflects the underlying situation. The research had compared public listed companies of European Union before and after full adoption of IFRS in 2005. The research concludes that IFRS has reduced earning management within EU by reducing earnings smoothing, managing earnings towards a target and the magnitude of cross-sectional absolute discretionary accruals, and accruals quality. IASB introduced IFRS 7, which became effective on 2006 within European Union. Although the standard is applied by every industry engaged in financial instrument reporting, it particularly has a strong effect on banking industry. Bischof (2009) states that overall disclosure level of European banks has improved after adoption of IFRS and a paradigm shift towards greater transparency is visible. The research further observes that apart from mandatory disclosures, voluntary disclosure has increased as well. Adoption of IFRS has led to emergence of a “two standard system” in many European countries. IFRS will be required for consolidated accounts while reporting principles used by non-listed companies would be different (Larson & Street 2004). Larson & Street 2004 also mentions that lack of quality guidance materials for IFRS in national language as an obstacle in adapting to IFRS. Significant time gaps have existed between issuance of new standards and interpretations and translating it to national languages. The issue affects few countries and larger firms do not feel an effect from the issue. Yet, IASB has a role to play in the scenario for smooth transition in to IFRS. Insufficient guidance for first time IFRS adopters, resistance by national standard setters, and complicated structure of IFRS and, requirement of excessive disclosures, especially with regards to SME (Small & Medium enterprises) are impediment in adapting to IFRS according to Larson & Street. IASB needs to work on these impediments to expand the usage of IFRS worldwide. IASB is trying to convince The Securities and Exchange Commission (SEC) of the US in to adapting to IFRS but so far the efforts have not being successful. Wesley Bricker, Chief Accountant of SEC declared in 2016 that SEC won’t switch to IFRS in the near future, but will continue to review a proposal to allow IFRS information to supplement U.S. financial filings (Shumsky & Rapoport 2016). Several researches have compared IFRS and US GAAP. However, many researches approve US GAAP over IFRS. But some suggest the opposite, stating that IFRS is equivalent to US GAAP in terms of the quality of information provided (Beneish & Yohn 2008). Atwood et al. (2011) has studied earnings persistence and the association between current account earnings and future cash flows under IFRS, domestic accounting standards in US and non US domestic accounting standards. The conclusions derived by the research were accounting earnings prepared under IFRS reveals less about future cash flows than accounting earnings prepared under U.S. GAAP even though earnings persistence is similar across all reporting regimes. While IFRS and U.S. GAAP are both high quality sets of accounting standards, U.S. GAAP is superior with respect to the prediction of future cash flows (Atwood et al 2011). Barth et al (2010) has concluded comparability of accounting reports between firms using US GAAP and non US firms who have adopted IFRS is higher than when the non US firms used domestic standards. Comparability under the study has been measured with respect to accounting system comparability and value relevance comparability. The research of Barthe et al (2010) also elaborated that non US firms who have adopted IFRS have managed to avoid earning smoothing, improved accrual quality and timeliness. However, the research suggests that accounting quality of US firms is higher. IASB needs to understand these issues brought up by various researchers in to their conceptual framework to deliver better accounting standards to be accepted by US accounting community. IASB and FASB work together in delivering accounting standard. IASB is the global accounting standard setter whilst FASB sets accounting standards for US. However, authority owned by FASB is similar and at times more than the authority of IASB because FASB represent a powerful economy. But instead of having two standard setters, merging them as one would bring better results because authority and power to set standards is brought to one place. This can be done if US adapt IFRS, which is not to witness in near future. Accounting professionals can further look in to ways which will help to combine these two accounting standards. The developing economies which adopted IFRS have gained more recognition and success in terms of financial reporting, which elaborates the critical role IASB plays as an international accounting standard setter. Political motives might influence performance IASB. The task of protecting independence of IASB lies not only in the hands of IASB officials, but the jurisdiction that uses IFRS has a responsibility too. However, IASB also needs to accommodate and encourage voice of jurisdiction which uses IFRS yet economically not developed as they are the ones who harvest the best from IFRS. ATWOOD, T.J. et al., 2011. Do earnings reported under IFRS tell us more about future earnings and cash flows?. J. Account. Public Policy, 30, pp. 103-121. BARTHE, M.E. et al., 2010. Are IFRS-based and US GAAP-based accounting amounts comparable?. Journal of Accounting and Economics, 54, pp. 68 -93. BENEISH, M.D. and YOHN, T.L., 2008. Information friction and investor home bias: A perspective on the effect of global IFRS adoption on the extent of equity home bias. J. Account. Public Policy, 27, pp. 433-443. BENGSSTON, E., 2011. Repoliticalization of accounting standard setting—The IASB, the EU and the global financial crisis. Critical Perspectives on Accounting, 22, pp. 567 – 580. BISHCHOF, J., 2009. The effects of IFRS 7 adoption on bank disclosure in Europe. Accounting in Europe, 6 (2), pp. 167 – 194. BURCHELL, S. et al., 1980. The roles of accounting in organizations and society. Accounting, Organizations and Society. 5(1), pp.5-21. CHEN, H. et al,. 2010. The Role of International Financial Reporting Standards in Accounting Quality: Evidence from the European Union. Journal of International Financial Management and Accounting, 21 (3), pp. 220-275. CRAWFORD, L. et al., 2013. Control over accounting standards within the European Union: The political controversy surrounding the adoption of IFRS 8. Critical Perspectives of Accounting, 25 (4), pp. 304 – 318. GEORGIOU, G., 2010. The IASB standard-setting process: Participation and perceptions of financial statement users. The British Accounting Review, 42 (2), pp. 103-118. GORDON, L.A. and LOEB, M.P. and ZHU, W., (2012). The impact of IFRS adoption on foreign direct investment. J. Account. Public Policy, 31, pp.374–398. IAS Plus, 2018. Overview of the structure of the IFRS Foundation and IASB. Available from: https://www.iasplus.com/en/resources/ifrsf (Accessed 17 June 2018). IAS Plus, 2018. International Accounting Standards Committee (IASC). Available from: https://www.iasplus.com/en/resources/ifrsf/history/resource25 (Accessed 17 June 2018). IFRS Foundation, 2016. Due Process Handbook: Approved by the Trustees January 2013. (Online). Available from: https://www.ifrs.org/media/feature/about-us/legal-andgovernance/constitution-docs/due-process-handbook.pdf (Accessed18 June 2018). IFRS Foundation, 2018. Analysis of the IFRS jurisdiction profiles. (Online). Available from: https://www.ifrs.org/use-around-the-world/use-of-ifrs-standards-by jurisdiction/#analysis (Accessed 18 June 2018). LARSON, R.K. and STREET, D.L., 2004. Convergence with IFRS in an expanding Europe:progress and obstacles identified by large accounting firms’ survey. Journal of International Accounting, Auditing and Taxation, 13, pp. 89–119. SODDERSROM, N.S. and SUN, K.J., 2007. IFRS adoption and accounting quality: A review. European Accounting Review, 16 (4), pp. 675–702. SUTTON, T. G., 1984. Lobbying of accounting standard-setting bodies in the U.K. and the U.S.A: a downsian analysis. Accounting, Organizations and Society, 9(1), pp. 81–95. conceptual framework review. Journal of Accounting & Public Policy, 27, pp. 495 – 502. ZEFF, S. A., 2006. Political lobbying on accounting standards – national and international experience,’ in: NOBES, C. and PARKER, R. Comparative International Accounting, 9th ed n. (London: Prentice-Hall).